Trying to keep your truck safe from damage can lead you to all kinds of arguments about the best way to protect your vehicle. While most people with trucks will agree that a bed liner is an excellent method of safeguarding the bed of your pickup, they are divided on whether a drop-in or spray-on liner is the superior option. In today’s blog entry, we will discuss why a spray-in Line-X bed liner is the superior choice when you want to provide the greatest amount of protection for your bed. When you need a bed liner or other truck accessories, give Line-X Sioux Falls a call today. We are an authorized Line-X dealer and installer who can apply your new bed liner quickly. Proponents of drop-in liners will say that there is virtually no difference between a drop-in liner and a spray-on liner. While there are some similarities between the materials used, a drop-in liner cannot compare to the level of protection that Line-X offers for several important reasons. First, a drop-in bed liner is much thinner than a Line-X protective coating. In order to save money and to reduce shipping costs, drop-in manufacturers make their liners as thin as possible. The thinness of the material is a problem for two reasons: it breaks more easily, and it can warp. Second, the materials in drop-in liners are not as advanced as the Line-X formula. Most manufacturers use relatively simple and common forms of plastic to create their drop-ins, whereas Line-X uses a specially developed proprietary formula that others simply can’t match. 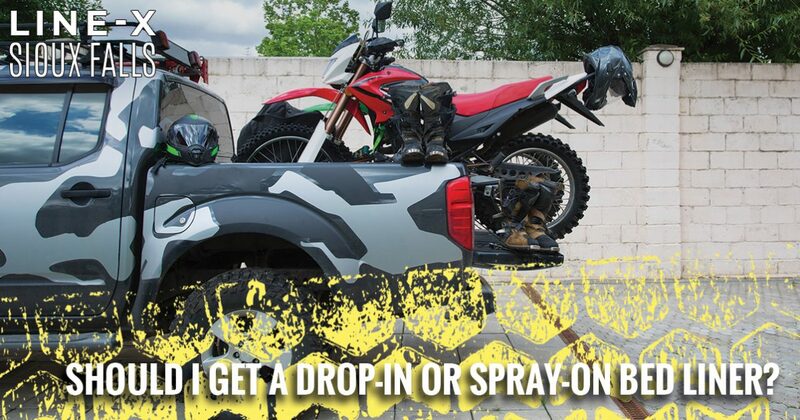 Line-X was developed in order to provide the specific kinds of protection that truck beds need, including protection from dents, dings, scratches, and chemical spills. A drop-in liner doesn’t stand a chance when compared to a Line-X bed liner’s reliability and protection. Drop-in liners can break if they get too cold, something hits them too hard, or if they were warped before or after it was installed. Line-X liners come with a lifetime guarantee that promises to fix or replace any liner that cracks, bubbles, or flakes. If you are ready for protection that can’t be matched by any drop-in liner, call Line-X Sioux Falls today. Our highly skilled installation technicians are here to perfectly apply your new bed liner or protective coating using the right tools and years of experience. Contact us today if you have questions about Line-X or any of the other truck accessories that we carry.